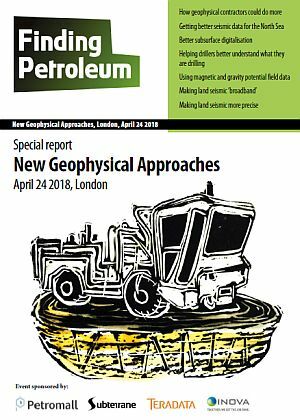 Our "New Geophysical Approaches" event in London on Apr 24 looked at better ways the geophysics sector can serve the oil and gas industry, and get new technologies deployed - helping the industry in its quest to develop reserves at lower cost. Dr Duncan Irving, practise partner oil and gas with analytics company Teradata, explained how a "digital workforce" can augment conventional geophysical workflows. Not a robot replacing a geophysict, but more a robot doing some of the geophysicist's less interesting work. David Bamford, founder of Finding Petroleum and a former head of exploration at BP, will share perspectives on what business models may work for exploration in the new oil industry world. Andrew Long, director of Subterrane shared ideas on better ways to work with potential fields data (gravity and magnetics) together with seismic, to help identify and parameterise structural geology. Andy Bull, VP emerging technology with INOVA Geophysical, explained how land seismic recording equipment is improving, leading to so-called broadband seismic, and higher resolution onshore images. The low oil price is not the only thing that has "been going on" over the last few years. There are profound questions being asked about the sustainability of the oil & gas industry and even in an "nothing will change!" view, we have to recognise that reserves replacement has been poor all round since about 2010 - Frontier exploration in particular no longer is delivering the volumes it once did. New digital technologies and capabilities can be brought to bear on existing geophysical workflows from seismic acquisition to geosteering. This requires a rethink in organization, process, skills and technology platforms. Duncan has been providing strategic and technical consulting on these areas for several years and will share his views on the opportunities, challenges and pitfalls as the upstream world meets digitalisation. Potential fields data is easy to come by these days. However it is often mis-used to support pre-conceived ideas to progress conceptual geological models. This devalues the incentive of potential fields use. Satellite free air gravity data correlates with topo-bathymetric relief, and not with geology, nor shallow crustal density variation. Free air gravity must be correctly processed to yield useful residualized products for interpretation. When this is achieved, only then can the gravity data objectively speak for itself. Gravity data on its own has ambiguity. Traditionally gravity data is interpreted with reference to the magnetic record, this is something that should not change in order to enhance the objective use of potential fields data. The user of such data can then enjoy identifying real structural geology and avoid a description of fabric, and the parameterization of geology. This will be demonstrated using an excellent case example. Andrew Long is a geologist and owner of Subterrane Ltd., graduating from Imperial College, London with BSc Geology with Geophysics and MSc Petroleum Geophysics. Andrew started his career with PGS Reservoir as a geophysicist and specialized in potential fields methods. Andrew is a Fellow of the Geological Society of London and an active member of the S.E.G. Andrew has research interests driven by projects in the East African Continental Margin, West African offshore Mauritania-Senegal-Gambia-Guinea-Bissau-Guinea Basin, and the Pacific and Caribbean Margins. Integrating old ideas and new technology to improve your exploration strategies. Synthesizing geological interpretation at any scale. Specializing in gravity and magnetic methods combined with geological and geochemical integration: utilizing real research, technology, and advances in measured data precision. This talk will reflect on the significant advances that have already been made with respect to Land Seismic Equipment, enabling operators worldwide to acquire cost effective but high quality Broadband seismic data and will look ahead to the potential offered by the latest generation of Nodal systems to take this capability even further. INOVA was formed in March 2010 when BGP and ION Geophysical each contributed land seismic equipment assets to a new and independent joint venture company. INOVA's strengths lie in their ability to develop and support rugged and reliable seismic acquisition equipment that enable geophysical service providers to efficiently design and execute complex seismic acquisition programs on behalf of their E&P customers around the world. INOVA's management team perseveres to create a unique 'best of both' culture that draws upon the distinctive attributes of its parent owners' skill sets and operating philosophies. INOVA's technical professionals reflect ION's rich tradition of innovation in land seismic product development, ARAM's philosophy of 'no excuses' customer service, and the practical operating insights BGP has acquired as the world's largest land seismic contractor. This unique blend of insights and capabilities ensure that INOVA's products remain on the cutting-edge of innovation, guided by the practical reality of what contractors require to reliably execute complex seismic programs in the most difficult operating environments. INOVA is committed to offer 'Best in Class' customer satisfaction. Through a global network of training, repair, and customer support centers, INOVA field service engineers are located in key petroleum centers close to their customers. These field support teams are available twenty four hours/seven days a week/three hundred sixty days a year and willing to go anywhere, anytime to ensure that INOVA's customers are able to complete their acquisition programs safely, on-time, and within budget. Working shoulder-to-shoulder with their customers, INOVA's field support teams are united by a common call to action: Together, We Get the Job Done. Where is Geophysics going in a world where Majors and mini-Majors declare themselves to be "Energy providers" with a heavy focus on Gas and on Unconventionals and Mature Provinces? What new capabilities do we Geophysicists, whether in an oil & gas company or in a service provider, need to develop and offer?